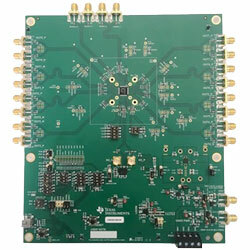 Texas Instruments LMK05318EVM evaluation module is designed to help evaluate the LMK05318 ultra-low jitter network synchronizer clock. The evaluation module can be used as a flexible, synchronous clock source for rapid evaluation, compliance testing, and system prototyping. The SMA ports provide access to the device’s clock inputs and outputs for interfacing to 50Ohm test equipment. The onboard XO options are included but can be reworked using the various XO/TCXO/OCXO footprint options or else bypassed to use the external SMA input. The EV offers a USB-based interface to access the I2C/SPI bus and control pins of the LMK05318. The TICS PRO software GUI can be used to program the device’s registers and EEPROM to store custom start-up clock settings.